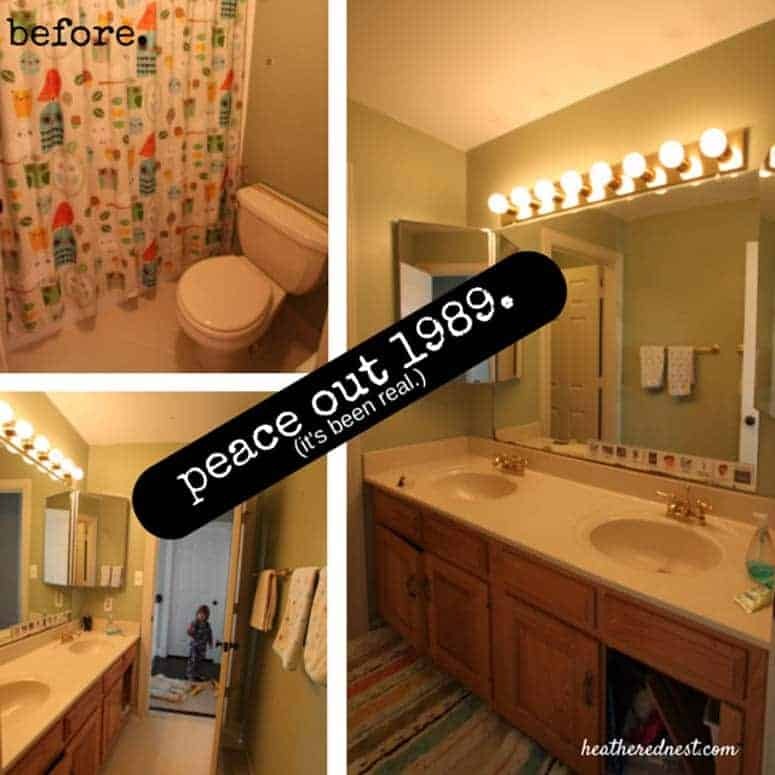 If you’ve made it here, you’ve probably been wondering, “can you paint tile?” You may have an old, outdated bathroom situation going on at home similar to what we had in ours. 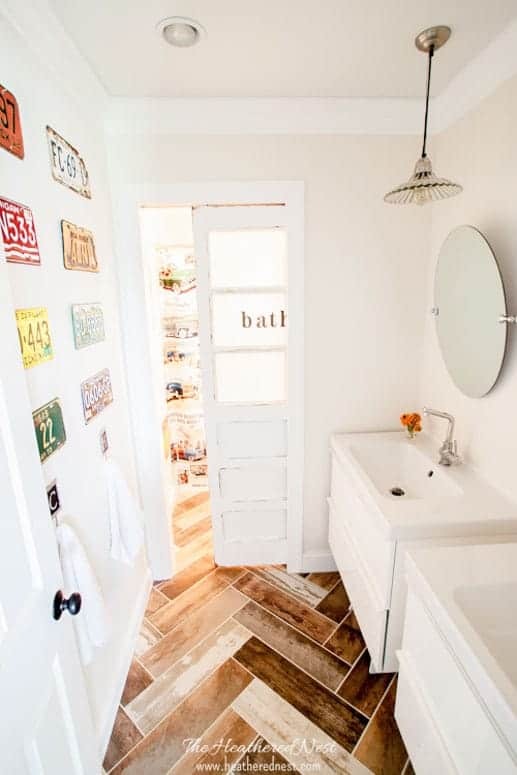 Maybe you’ve heard some buzz about painting tile…scrolled past some Pinterest pins claiming that tile paint is an option. If this all sounds familiar, you’ve come to the right place. Just like 80’s hair, the color “almond” was BIG in the 1980s and early 1990s. 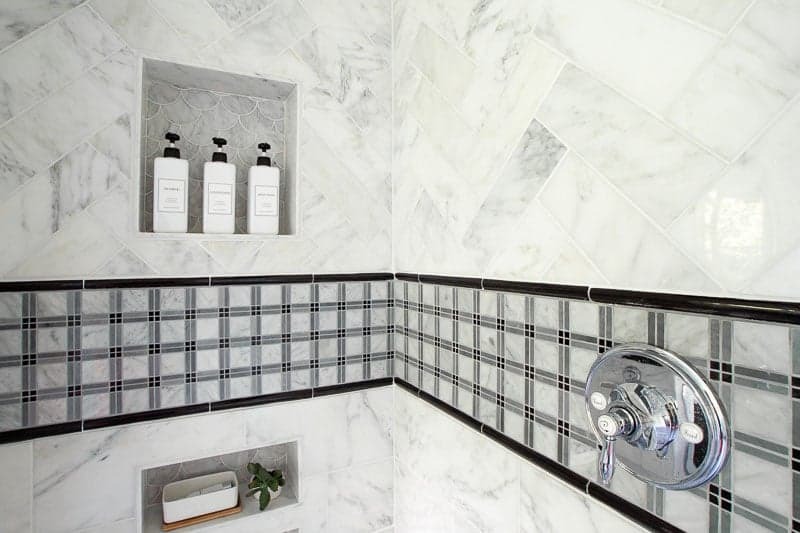 Off-white, beige, buff…whatever you wanna call it, we liked it to tile our homes with. Preferably in a 4″x4″ square. That was rad. What’s funny is that in a decade where neon was thought to be so awesome, we sure played it safe when choosing our tile, am I right? Hey, things come, things go. But just like they said in that great 1994 SNL sketch, it’s now about time for us to be saying “buh – bye” to our outdated almond tile. 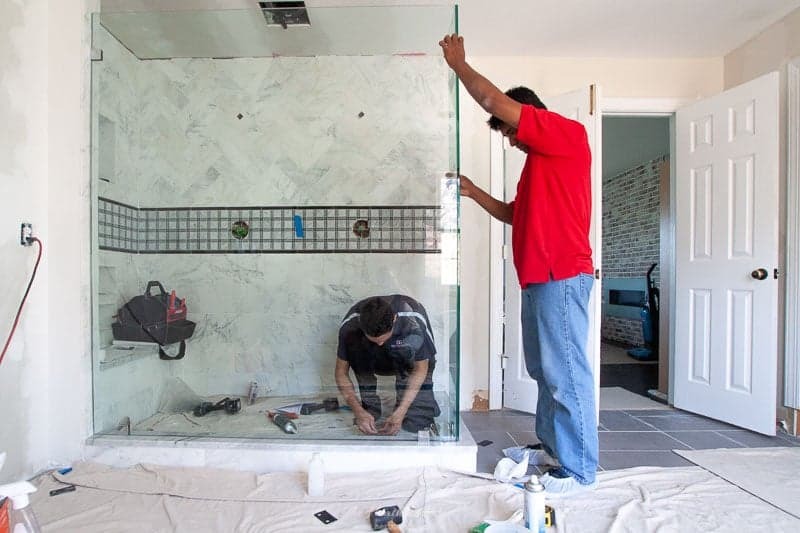 The thing about tile, and bathroom remodeling, in general, is that it’s EXPENSIVE. And we’re taking a serious hiatus this year on all things pricey. 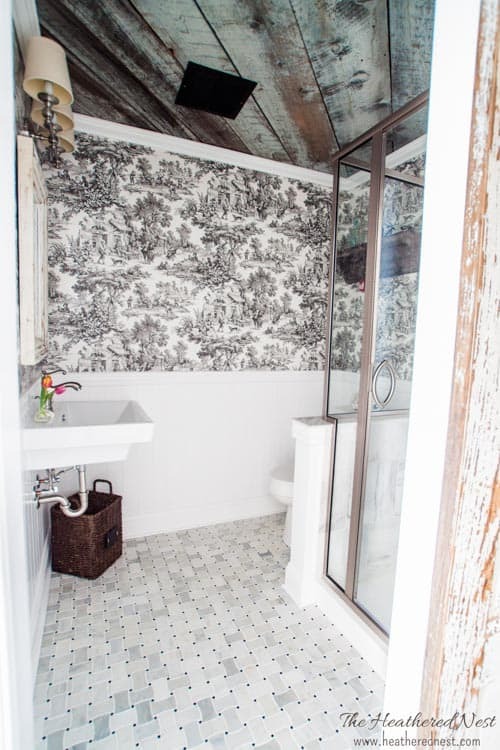 Like, for date night, I’m looking at restaurant reviews that say THIS: $ and DO NOT say THIS: $$$$ (and in all honesty, date night didn’t even make the final budget proposal this year…we’ll be date nighting it a casa con take-out while we DIY this bathroom to save some loot). Same thing for this kids bath project we’re working on. 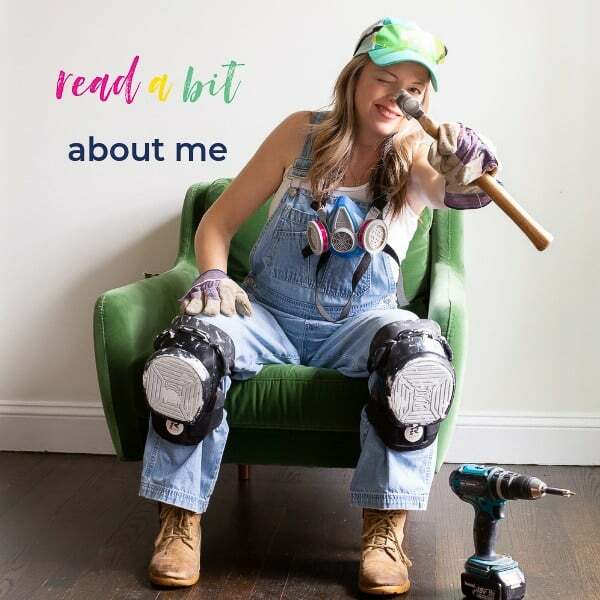 In an ideal world where I had enough cash-on-hand to start a foundation like Bill and Melinda Gates (who, sidenote…happen to be the epitome of the word “hero”), then I would probably go for broke, rip all this outdated builder grade mess out and start anew. But I need the OPPOSITE of going for broke. I need the million dollar look at rock bottom pricing because I don’t need to be floating a loan in that bathtub in lieu of a rubber ducky. 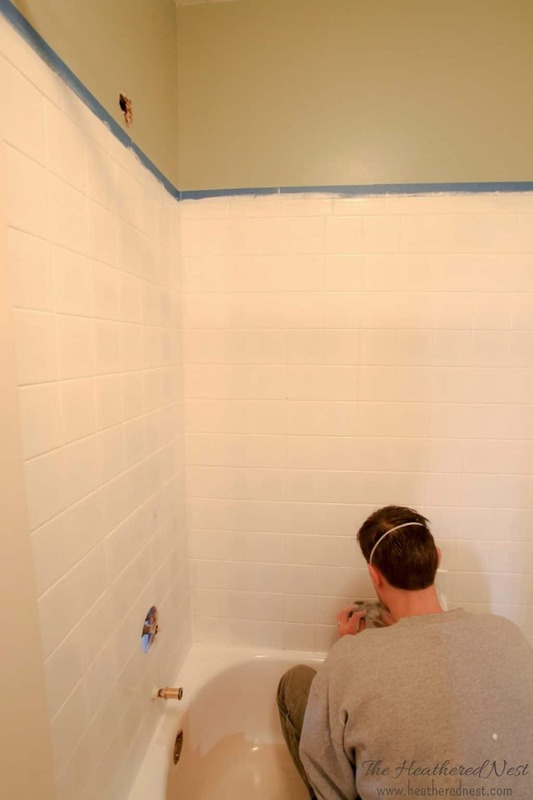 Painting tiles with A Tub & Tile Refinishing Kit. 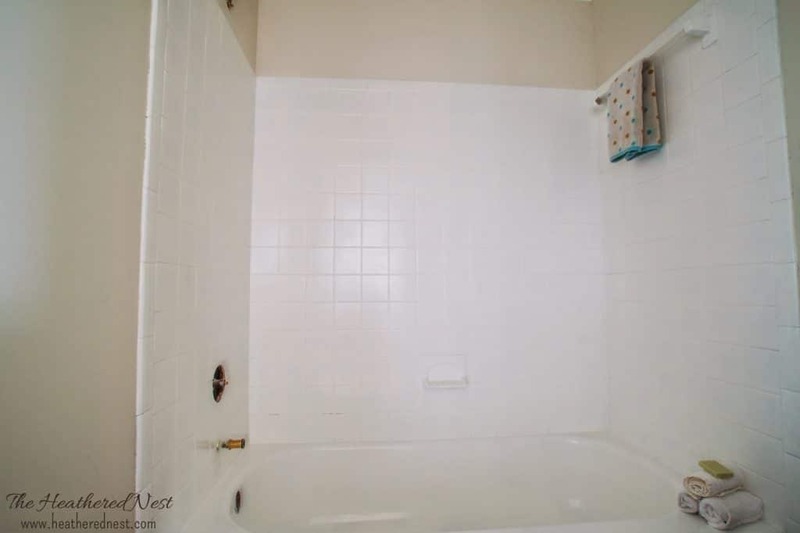 To demolish, purchase and install a new tub and shower surround would have cost somewhere in the neighborhood of $1000-2000. With this kit, I can refinish the existing tub and surround, making it a clean white, for about $50 TOTAL. 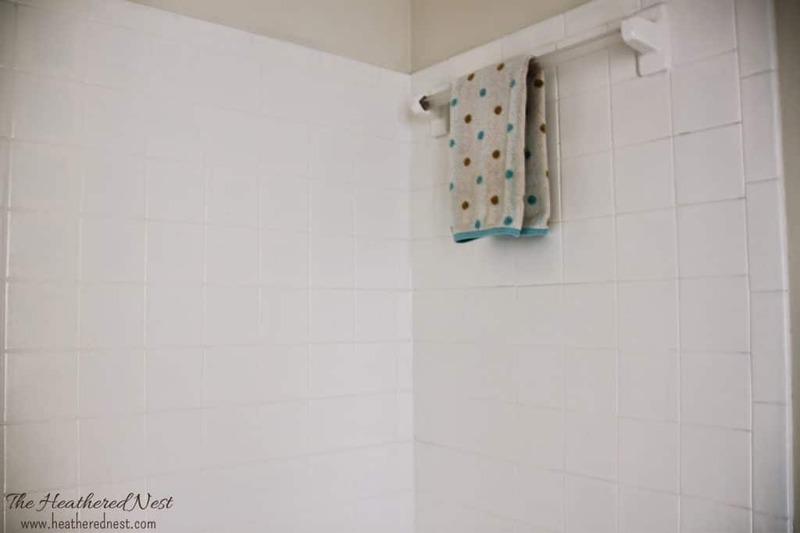 Since this tub and shower are always behind a shower curtain and used by our children, who we’ve established prefer NOT to clean themselves in any way, I feel like this is kind of a no-brainer. Here again, is another before of the almond surround. The lighting in this baño is pretty horrible (another item on our rehabilitation agenda). I originally read about the use of this product on the fantastic blog, Petite Modern Life. Karisa writes a full tutorial on painting tiles using this product, so I would encourage you to read her post if you’re interested in using it. There’s a second online tutorial for this same product that I’ve read as well. Also super helpful. That one is over on Domestic Imperfection. Before you break out your paintbrush, make your life easier with the FREE DIY printable instructions and supply list for this project, as well as many more DIY tutorial guides! 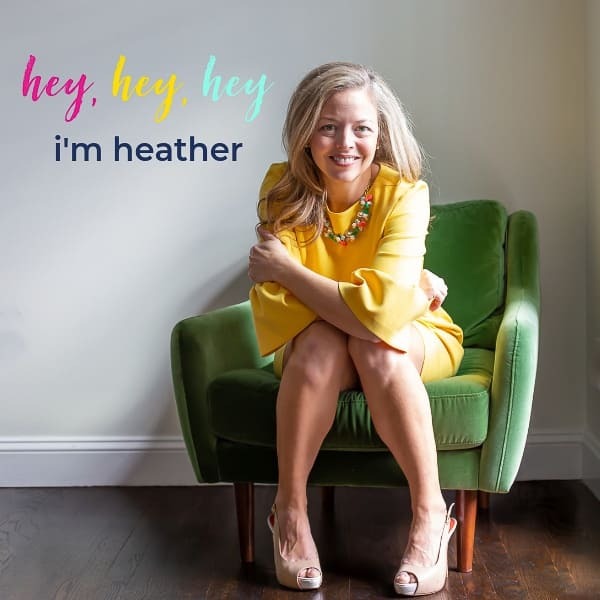 Click below to get instant access now⤵️! ** This stuff SERIOUSLY smells. I would consider doing this on a Friday morning before you’re headed out of town for a weekend…a weekend in May when you can leave your windows open when you’re gone. No joke. Do not pass GO before you get yourself a GOOD respirator mask to use while tackling this. Do it. If your surface is not completely clean, I don’t think your finish will last very long…just a hunch. The instructions also call for a light sanding of the surface before you begin. 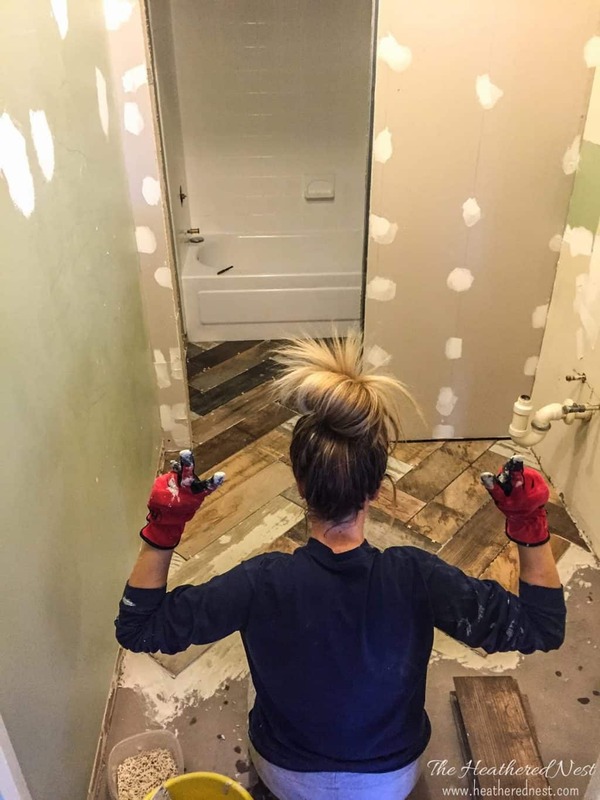 I did NOT do this step because our tiles are smooth porcelain and I did not think that I would be able to get a good uniform sanding job done on them with their slightly beveled edges, etc…plus, as you may already know, I’m prone to being a tad lazy. The product is sticky but goes on with a regular old paintbrush. I wish I could have simply rolled it on, but it wasn’t getting between the tiles that way, so I ended up painting the grids (vertical and horizontal grout lines) with a paintbrush. Took 2 coats, then rolled 2 coats over the whole surface after that. Here you can see the progress! It’s coming along! Can you see where we’ve started on the tub in this shot? The tub was a bit tricky with all the angles. The roller worked well (mostly) but you’ll have a little bit of a challenge on some of the larger angles. 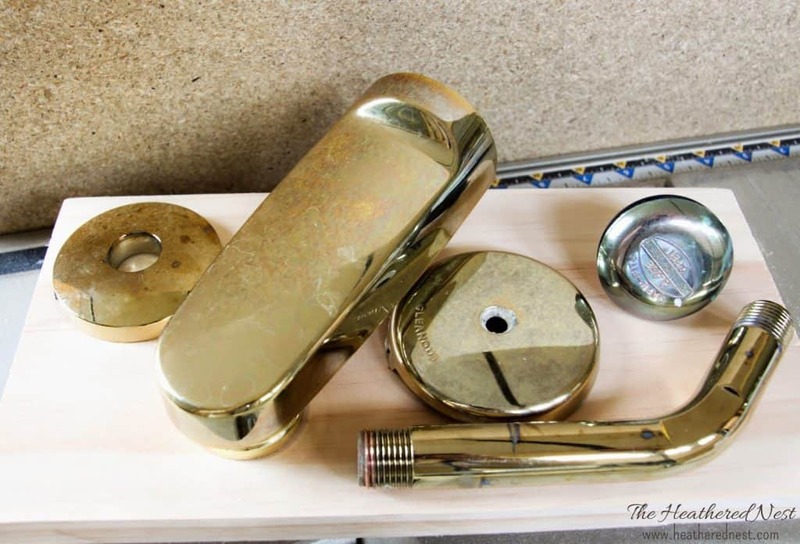 The original shower/tub faucet kit. Think I’m getting rid of it? No way. Gonna paint these suckers too. More on that maybe next week. For now, wanna see how the tub/surround is looking?? OK, so if you were expecting a miracle, you’re banging on the wrong bathroom door. It’s still 4×4 tile, folks. But there was no need to throw the baby out with the bathwater here, you know? 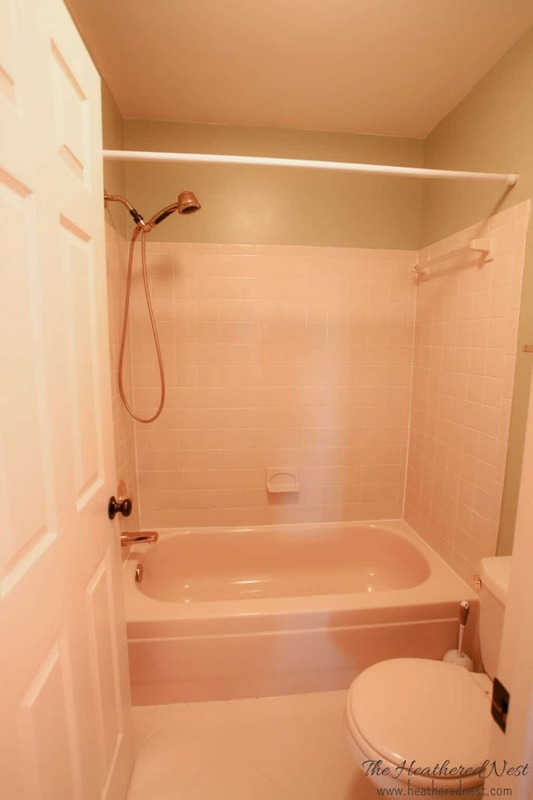 It was a perfectly functional tub and shower. I just wanted a little bit of an update. And for $50, I think we did well. Now, I have no illusions that this will be a lifetime fix. I think that within a couple of years, this remedy will be showing some signs of wear and tear. I could be wrong. Good thing is that Rust-Oleum makes a touch-up kit for this product!! 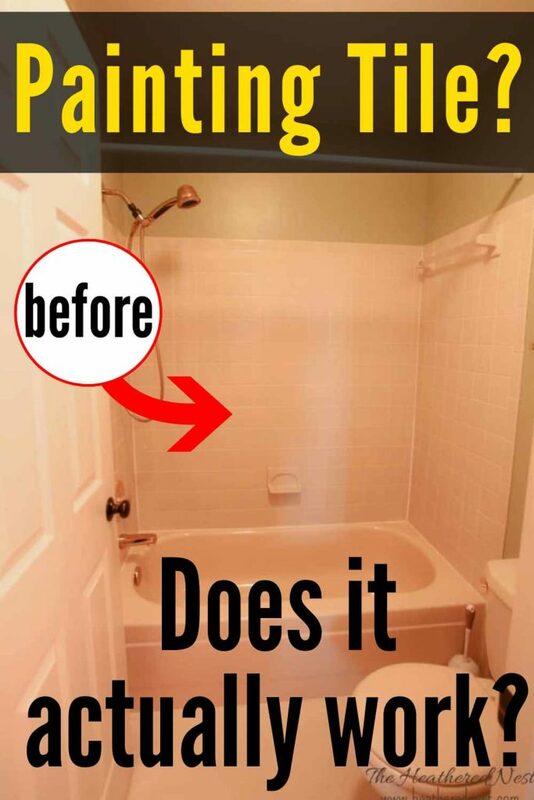 Click here to see the update post/how this tub and tile paint has held up over the years! I’m going to buy some of those kits now because I know that as we continue this reno project, the chance that this tub is going to be dinged during tile installation or something is exceedingly high. Pin this post for later! And if you try it, leave a comment on the pin! 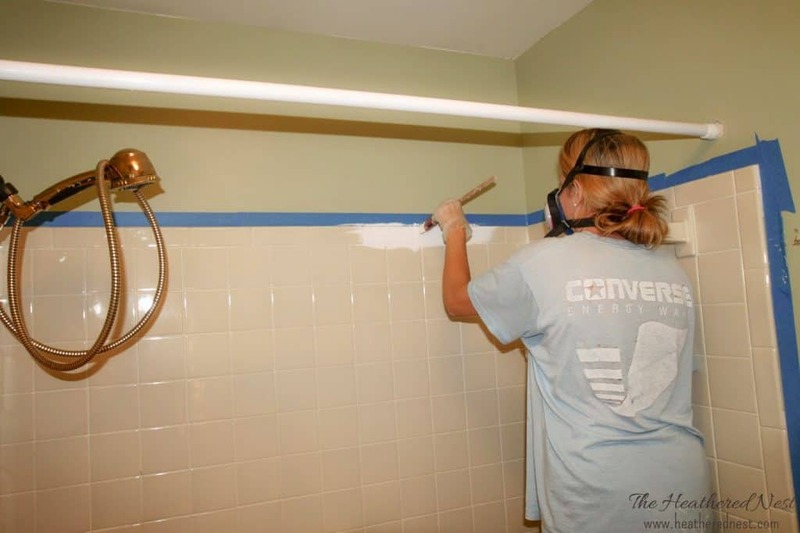 We’d love to see how the tile painting turned out at your house! 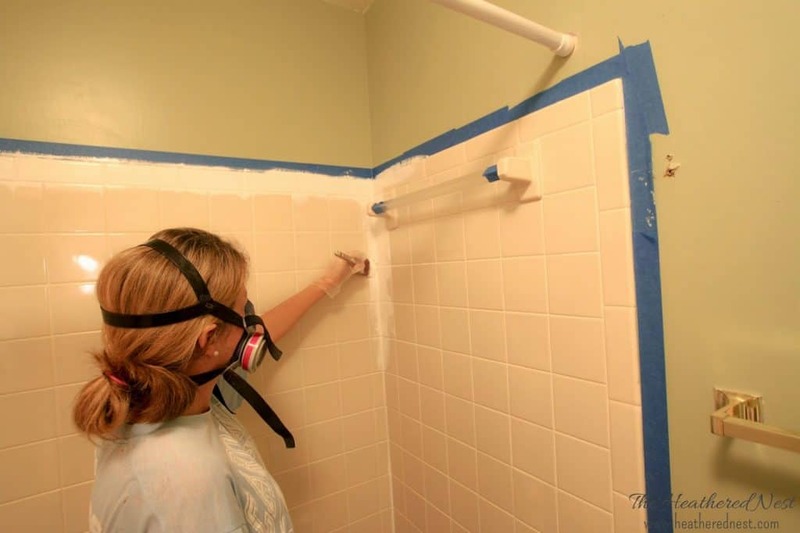 Plus, comments help others decide whether this is a DIY project they think they could tackle, too! It’s been a few years now how is your tiles holding up? Hey Lizette! I need to write a post to show people how it looks now! It’s great on the wall tile. 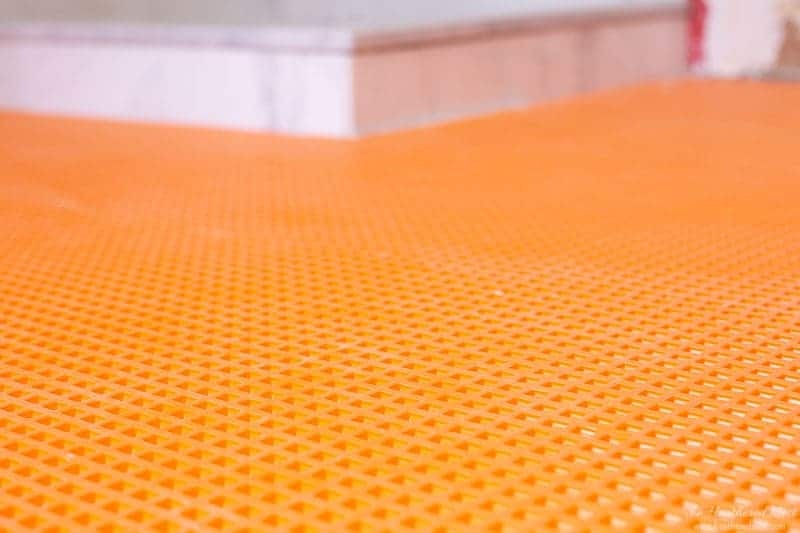 We made a mistake of putting down an anti-skid mat on the tub floor so that our little one wouldn’t slip and fall in the tub when he was small…kind of a necessary thing 😉 And that was FINE when it stayed in place. But we had a maid clean the house once, and she pulled it up. Uh Oh. That DEFINITELY took off the paint on the tub bottom. I’m going to just slap more paint down there once we take that mat out for good. But the walls look great. No issues at all. I’m wondering about cleaning it. 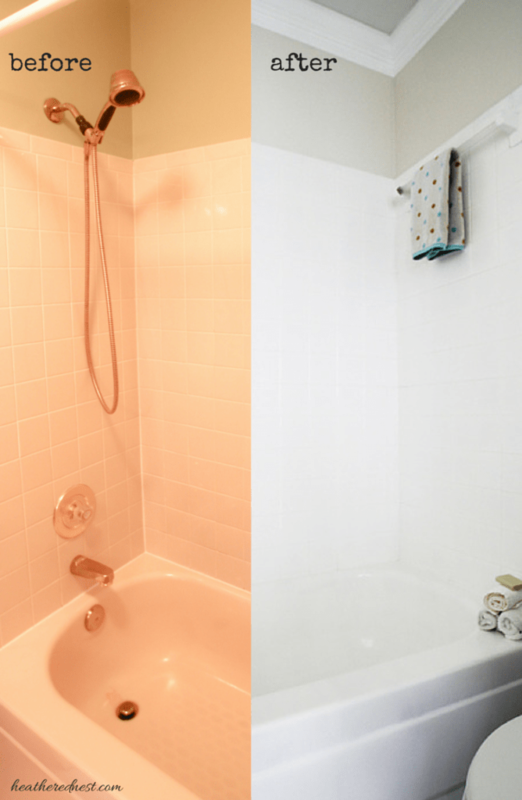 You wouldn’t dare scrub it with anything drastic or put a harsh chemical on it – correct? I don’t use super abrasive cleaners/scrub brushes on it, Karen. I’m not sure how the tile would respond, so I just have been nervous to try it. SO, I’m not a ton of help answering your question definitively. I love this make over! I have a fiberglass surround that has a tile imprint. 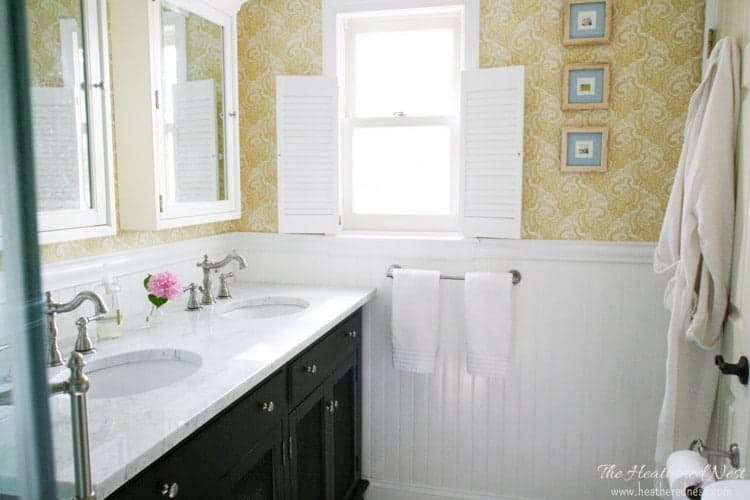 I am going to try this on the tub and surround!! 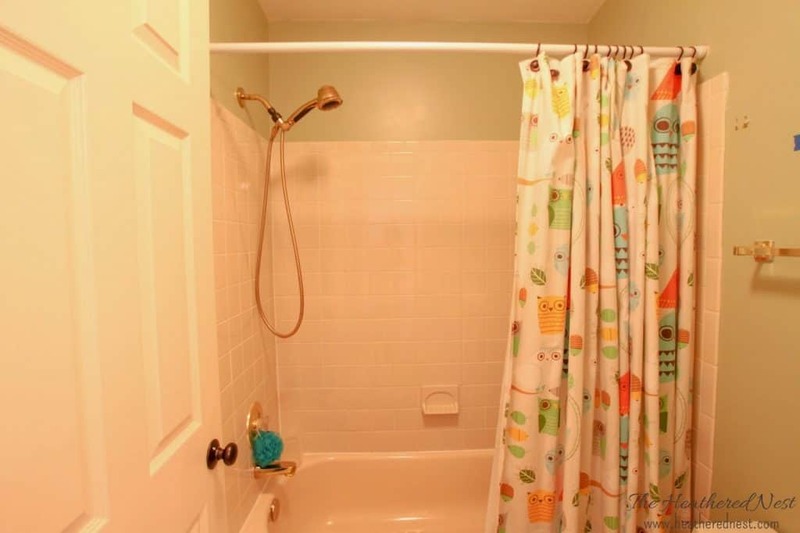 My son has turquoise tile and tub. Do you think 3 coats will cover that. Or would he need more? What other colors did it come in? 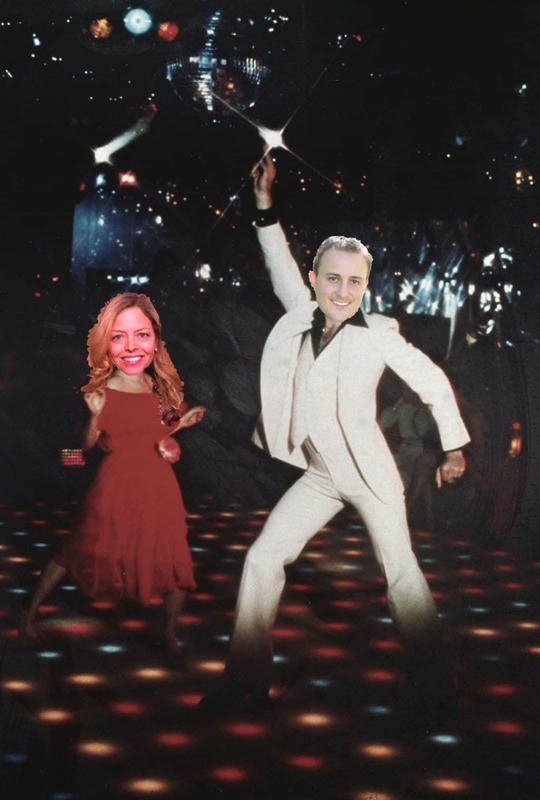 Thanks again for this great redo!